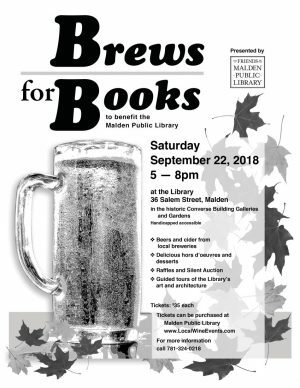 The Friends of the Malden Public Library are excited to invite you to the first Brews for Books fundraiser on Saturday, September 22, 2018 from 5-8 pm. Taste the wares of local craft breweries and cider makers and enjoy food from our local Malden eateries in the historic Converse Library and Art Galleries. There will be live music, games, raffle items, and a silent auction. Tickets are $35 and available at the Malden Public Library and online at www.localwineevents.com. Don’t wait; tickets are limited. You must be 21 years old to attend this event.